Voice over Internet Protocol (VoIP) is just a long way of saying you use your internet connection to make phone calls. It can save you big money on your phone bill, especially if you make a lot of long distance and overseas calls. Also, with a cloud-based VoIP platform you don’t need an actual landline. You can run VoIP off a mobile device, so if your business takes you out and about in the fresh air, far from fluorescent lights and air conditioned board rooms, a VoIP system can keep you connected and do it cheaper than your cellphone or landline. You probably already use some sort of internet phone service, such as Skype or WhatsApp, but a full-on business VoIP plan takes the idea further. With a professional, business VoIP package, you can also get a whole gang of tools to help your business run better. Even if you’re not the biggest company, you probably get in the weeds sometimes and can’t instantly answer every call that comes in. This feature routes incoming calls to the extensions they need—or to voicemails—without an actual human receptionist present. Let a machine transcribe your voicemail messages and send it to you in an email. This way you can have a running record of all of your incoming and outgoing calls written down, with an audio recording to boot. This feature allows you to hold conference calls—with or without video—with multiple phone lines and extensions located around the world, seamlessly and instantly. It’s perfect for managing a business remotely, especially if it has a lot of moving parts. Get all your voice, fax, and email messages under one roof in a unified inbox. Redirect your incoming calls to different extensions—all within a specific, predetermined group. Customers will call a main number, and the VoIP system will take care of the rest. 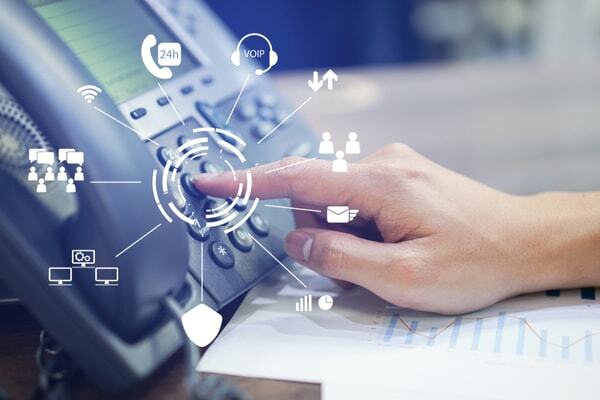 Most VoIP systems can integrate with software programs like Salesforce, Zendesk, and Maestro that help countless companies big and small run more efficiently. Zoom out: How can VoIP help you? On a day-to-day basis, there are 3 fundamental ways that VoIP can make a big difference for equipment sales and rental businesses. Call quality: VoIP systems are known for maintaining crystal clear voice quality, which is no small thing when you’ve got employees outside in the field—or inside the shop or office—working with heavy machinery. In high-volume work environments, having a clear and reliable communication system is key. Availability: By giving you the ability to route, record, and follow-up on a large volume of phone calls, a VoIP system can give you the services of a front office without the need to hire a receptionist. In other words, with VoIP, you have the backup even if you don’t have the manpower. Mobility: Chances are you’re doing a lot of work remotely, especially in a field like equipment rental, which tends to involve working with far-flung clients. A VoIP system makes sure you and your employees stay connected—on phone calls, video and audio conferencing, and more—so you can keep on top of things, even when they aren’t in house. When it comes to your VoIP system, the most important factor will be figuring out which one is best for you. Look at the size of your company, how many extensions you think you’ll need, which features are most important, and which companies have the best reputation. Once you realize what you need, you’ll be that much closer to locking in the VoIP service that’s right for you. With more than 40 standard features, Vonage is an award-winning VoIP platform that is easy to set up and use, so it shouldn’t be a problem to operate even if you’re running a small equipment company without any IT support staff. The company’s Vonage Business Cloud platform is designed for small- and medium-sized businesses, but it is fully scalable to larger, enterprise-level clients as well. The top-notch voice quality comes in handy when you’re running a business like equipment rental where time is of the essence. And with team messaging and video conferencing, you can easily keep in touch or hold a meeting with your associates be they in the front office, the back lot, or even the top of a scissor lift. Vonage can also integrate with a number of customer relations management tools—such as Salesforce, Microsoft Dynamics, and G Suite—among others. For more information on Vonage VoIP check out this in-depth Vonage review, or visit the Vonage website. RingCentral offers a cloud-based business VoIP service for small- to enterprise-level businesses. You can easily stay at the essentials plan if you have less than 10 users, or upgrade for just $5 more per month. 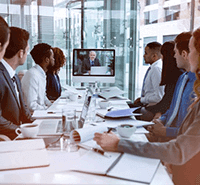 Even on the most basic RingCentral plan, you can take advantage of video conferencing for 4 people, meaning that even a small, agile equipment and sales rental company can run its telecommunications with the ease and efficiency of a much larger organization. RingCentral comes with dozens of features that can provide even a small business with the sort of telecommunications horsepower of a much larger operation. You can easily set up an auto attendant to field your calls when you’re out in the field, or say, send faxes directly from your cell phone even while parked out in your truck. In addition, it can integrate with more than 100 business apps—which is as many as, if not more than, just about any VoIP company out there—so you can rest assured that your business can scale in the future. Not only that, but RingCentral is notably simple to set up, and you can easily order equipment you need through the company. If you’re looking to upgrade to the RingCentral enterprise package, you’ll have to contact the company to get a price quote. Once you’re set up on Enterprise you can make us of an all-in-one unified platform for voice, video meetings, and team collaboration and messaging. The system is easy to set up and use on mobile and desktop. For more information on RingCentral VoIP check out this in-depth RingCentral review, or visit the RingCentral website. OnSip counts some impressive clients in its Rolodex, including Mozilla and Tumblr but that doesn’t mean they’re only for tech heads and don’t have the calloused hands to do VoIP for an equipment rental business. Not only that, but the award-winning VoIP platform gives you one of the most extensive lists of features available, and you can oversee it all from a straightforward, easy-to-use dashboard. One of the best things about OnSIP is that you don’t have to automatically pay a set fee per user, and can instead opt for the per minute plan. You pay a flat monthly fee for the service, and then pay for the minutes you use and for each feature that you add a al carte. The features can add up though, with auto attendant costing $19.95/month and ring group costing $14.95, just to name two. Still, this means that the service can be just right for a small equipment sales and rental company that has irregular calling needs, or one where multiple employees need to be able to make extensive phone calls from in or outside the office at a moment’s notice. The company doesn’t offer an enterprise-level pricing plan, just the per user and per minute plans. Nonetheless, through the a la carte features you can build your own custom VoIP platform to fit the needs of your growing enterprise business. Some of the integrations you can implement with OnSip include Zendesk, Slack, Microsoft Office, and Google Analytics. The VoIP is also easily scalable as your company grows. For more information on OnSIP VoIP check out this in-depth OnSIP review, or visit the OnSIP website. Grasshopper is known as the entrepreneur’s phone system, and its business model is built around helping small and medium sized business build the type of telecommunications system that can help them punch above their weight. You don’t need any additional hardware to run Grasshopper. The service is sold in 3 different pricing levels, all of which include unlimited minutes. The system is set up to be easy to run for companies that don't have their own IT department. The company is known for its premium sound quality as well as a number of standard features, including one that automatically converts faxes to PDF and emails them to you, business texting, and voicemail transcription, to name a few. Basically, Grasshopper can really give a boost to a small equipment company that wants to improve its telecommunications but doesn’t need the type of horsepower bigger companies are looking for. Also, with features that make office tasks easier (converting faxes to email, voicemail transcription), you can turn more of your time and attention to the heavy lighting part of the work. While Grasshopper is designed with small businesses in mind, it does have a plan that approaches an enterprise solution. Named the “small business” plan, it includes 5 numbers with unlimited extensions for $80 per month. The plan also comes with all of the same included features such as business texting, unlimited minutes, read your voicemail, and more. You can also reach out to the company at any time through its 24/7 customer support system. For more information on Grasshopper VoIP check out this in-depth Grasshopper review, or visit the Grasshopper website. 8x8 is a global VoIP system that provides the “X Series Cloud Service” for businesses large and small. On this system you can enjoy integration with Outlook, Salesforce, Netsuite, Zendesk, and more, as well as a long list of features including auto attendant, call recording, unlimited internet fax, analytics, and interactive voice response, just to name a few. 8x8 is fully-mobile, easy to use and set up, though the X6 and X8 plans could be a bit pricey for many businesses. No matter which plan you go with, you can set up unlimited calls to several foreign countries, and affordable rates for a host of other countries. 8x8 is a great option if you have clients in far-flung locales—foreign and domestic—who you need to stay in touch with clearly and reliably. The system puts it all together on a feature-rich, fully-mobile platform that you can operate no matter where your business takes you. And while the company doesn’t have a specific enterprise-companies-only level of service, with the X8 edition you can access audio and video conferencing for 100 participants, and a wealth of features not included in the other plans. For more information on 8x8 VoIP check out this in-depth 8x8 review, or visit the 8x8 website by pressing the button below. Sometimes it’s hard to see the forest for the trees, the tiller for the shanks, or the snowcat for the tracks. This is certainly true for the equipment industry, where with so much focus on the heavy machinery it’s easy to lose sight of the ins and outs of office life that keep the bills paid. Wherever your business is going, and whatever you need to get there, your telecommunications infrastructure is key. You can be a small equipment rental company with just a few companies or a multi-state operation with a workforce in the hundreds—VoIP business solutions can make things run smoother and save you some money on your telecommunications and save you some headaches.